This B&H Kit combines the Synology RackStation RS3617RPxs 12-Bay NAS Enclosure with twelve Seagate 4TB IronWolf 5900 rpm SATA III 3.5" Internal NAS HDDs for a total storage capacity of 48TB. The RackStation RS3617RPxs 12-Bay NAS Enclosure from Synology is an enterprise-class NAS system that comes with twelve bays so you can create a storage pool of centralized data for connected users. This RackStation can accommodate hard drives and SSDs that feature a SATA-based interface. Without disrupting service, you can further expand the RackStation's storage capacity by connecting up to two expansion units. For performance, the RS3617RPxs is outfitted with a quad-core 2.4 GHz Intel Xeon D-1521 processor along with 8GB of ECC DDR4 RAM to manage the DSM operating system, virtual machines, and other apps. Shared data is delivered to the users via four Gigabit Ethernet ports, which support link aggregation and failover. Other notable connections include two USB 3.0 ports. Moreover, two PCIe slots are available, so you can enhance the network deliver rate by installing optional 10GbE NICs to the system. The RS3617RPxs delivers up to 3829 MB/s sequential throughputs and 433,873 IOPS under a RAID 5 configuration with 10GbE Link Aggregation. Equipped with 8GB DDR4 ECC RAM (upgradeable to 64GB), the RS3617RPxs ensures data accuracy when handling high-value data and mission-critical tasks across large-scale businesses. 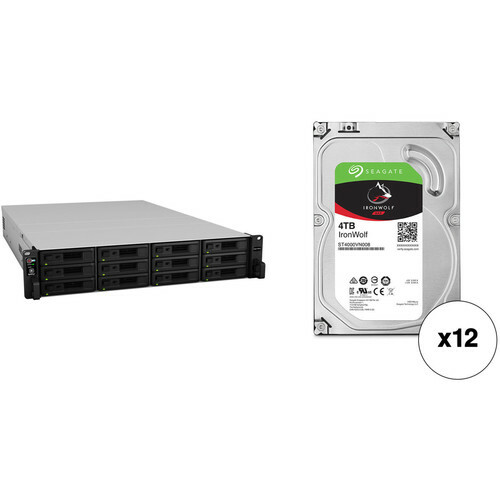 As your data storage needs grow, the RS3617RPxs can be connected to an optional RX1217/RX1217RP2 expansion unit, allowing you to expand storage capacity up to 36 drives without disrupting service. A high-bandwidth expansion cable ensures speedy data transmission between the main server and expansion unit. Four built-in LAN ports with failover provide reliable redundancy in the event of unexpected network failure. This system includes a fan-less CPU heat-sink and passive cooling technologies, which prevents having a single point of failure. The RS3617RPxs is equipped with an encryption engine that offloads encryption calculation tasks away from the main CPU. Thus, the CPU can be free for other important tasks. In addition, Advanced Encryption Standard (AES) on shared folders with hardware acceleration ensures security without compromising access performance, providing over 2916 MB/s throughput for reading. The RS3617RPxs enables the combination of hard drives and read/write-optimized SSD cache, boosting throughput efficiently while minimizing cost per gigabyte. With full SSD cache reading and writing support, the RS3617RPxs offers a significant reduction in I/O latency without crippling your budget. Synology's DiskStation Manager (DSM) is a sleek, browser-based operating system running on every DiskStation and RackStation, which makes managing your Synology NAS a breeze. Featuring an intuitive user interface, DSM makes accessing and sharing your data smarter and simpler. Synology's Package Center lets you download and install useful add-on packages designed specifically for individual or business needs, meaning you can enjoy more entertainment in your life or better productivity at work. With the support of Windows AD, LDAP, and Domain Trust, the RS3617RPxs enables seamless account integration. The User Home feature can automatically create a "home" folder for every user account to minimize the administrator's effort in repeatedly creating "home" folders for all accounts. Windows ACL support on RS3617RPxs allows IT administrators to fine-tune access controls and set up privileges to files and folders on the RS3617RPxs through the familiar Windows user interface. With compatibility for major protocols, the RS3617RPxs can eliminate server configuration overhead and enhance an IT administrator's efficiency. When dealing with large-scale data storage, businesses require a solution that offers reliable backup and prevents file corruption. With support for the next-generation Btrfs file system, the RS3617RPxs ensures information is stored with a high level of data integrity, while providing flexible and efficient data protection tools. The RS3617RPxs provides seamless storage solutions for virtualization environments, including VMware, Citrix, and Microsoft Hyper-V. With VMware vSphere & VAAI integration, the RS3617RPxs helps offload specific storage operations and optimizes computation power in VMware environments. Windows ODX support speeds up data manipulation as the data transfer is offloaded. iSCSI also lets SMB users consolidate storage into data center storage arrays while providing hosts with the illusion of locally-attached disks. The RS3617RPxs enables businesses to cost-effectively manage multi-protocol data by integrating file-level (NAS) and block-level (SAN) storage into one unified storage system. Files can be shared across Windows, Mac, and Linux platforms seamlessly with comprehensive network protocol support (CIFS/SMB, AFP, and NFS). The RS3617RPxs provides a cost-effective iSCSI solution, allowing large scale businesses to consolidate storage into data center storage arrays. With thin provisioning available for file-level iSCSI LUN, you can maximize storage utilization by oversubscribing provisions and grow storage space as needed. The RS3617RPxs enhances the ease of moving and copying data in a virtualized environment with the features LUN Snapshot, Clone, and replication. Synology's LUN Clone and LUN Snapshot only consume 1/1000 of the original size, highly optimizing storage usage. In addition, Synology's LUN Snapshot lets you create up 256 snapshots per LUN using point-in-time technology without having any impact on system performance. With better support to servers under VMware vSphere or Windows environment, IT managers can expect guaranteed VM status and data consistency through application-consistent snapshots. For enterprises with more than one Synology NAS server, Central Management System (CMS) offers the flexibility and convenience for IT administrators to manage all of them from a single point of entry. Through a simple interface, you can obtain a clear overview on resource consumption and logs, helping you identify any issue right away. With group policies, CMS can do much more for your daily tasks. Once a NAS joins a group, it will automatically adopt its rules and behave as intended, without extra configuration. With comprehensive cloud solutions, the RS3617RPxs lets you create your own private cloud easily. Cloud Station syncs files across multiple devices. Files can be edited in offline mode and later synced to Cloud Station, which keeps up to 32 historical versions, allowing you to restore a file back to previous version or recover deleted files. With the mobile app DS cloud, any change made to a file is automatically synced to your smartphones and tablets. For distributed enterprises, Synology's 2-way sync between different DiskStations ensures employees at different locations share the same information in real-time. IT administrators can handpick individual folders that they want to sync to different devices, manually or automatically based on file format and size. Folders synced by Cloud Station can be encrypted on DSM - no one will be able to access its content without your private key. Uninterrupted availability is a critical goal for all businesses. The RS3617RPxs offers Synology High Availability (SHA) technology which combines an active and passive server into one cluster, the former always mirrored to the latter. Shared Folder Sync can replicate data in real-time to another Synology NAS at a remote location, giving your business the Recovery Time Objective (RTO) for prompt disaster recovery. With multiple LAN ports, the RS3617RPxs also ensures redundancy in the event of unexpected network failure. The RS3617RPxs offers advanced security measures to protect you from potential security holes. Security Advisor analyzes system settings, password strength, network preferences and removes any possible malware. AppArmor blocks malicious programs from accessing unauthorized system resources. You can also customize the trust level in Package Center to avoid installing packages from untrusted sources, safeguarding your NAS from unknown or tampered files. In addition, the RS3617RPxs provides other security add-ons such as AES encryption, 2-Step verification, IP block & allow list, Antivirus packages, firewall, and DoS attack prevention. Designed for use in 1-8 bay NAS environments within home, SOHO, and SMB environments, the 4TB IronWolf 5900 rpm SATA III 3.5" Internal NAS HDD from Seagate is built to withstand 24x7 operations, or 8760 hours per year. This 4TB drive has been equipped with a SATA III 6 Gb/s interface, a rotational speed of 5900 rpm, a 3.5" form factor, and a 64MB cache, providing users with an ample storage capacity and data transfer speeds of up to 180 MB/s. This IronWolf hard drive also has an MTBF rating of 1 million hours, 600,000 load/unload cycles, 1 in 1014 non-recoverable read errors per bits read, and a workload rate of up to 180TB per year. Protection is provided by a limited 3-year warranty. Box Dimensions (LxWxH) 33.4 x 24.3 x 9.0"